Kevin Ford is the founder and Director of the Leadership Conservatory for the Arts at Tarpon Springs High School. He is presently in his twenty-third year of teaching in the public school system as the Director of Bands at Tarpon Springs High School. His responsibilities include directing the Wind Ensemble, Marching Band, Solo and Ensemble Coach, supervising all Conservatory performance ensembles, and developing the curriculum for the Conservatory Student Leadership Courses. In addition to his duties at Tarpon Springs High School, Mr. Ford enjoys an active schedule as a leadership speaker, guest clinician, and adjudicator throughout the country. He has also been a nationally recognized accomplished show designer for the past 27 years. Mr. Ford is the Co-founder/owner of the Inspire…. Music and Entertainment Production Company. Mr. Ford received his Bachelor of Arts in Music Education from the University of Florida. He is a member of the Music Educators National Conference, the Florida Bandmasters Association, the Pinellas County Music Educators Association, and the Phi Kappa Psi Honor Society. He currently serves as a member of the Bands of America Educational Advisory Board. In 2004, Mr. Ford was selected as member of the Who’s Who Among Teachers, and in 2005 was selected for the Who’s Who Among Americans award. In 2008 and 2011, Mr. Ford was featured in the national publication School Band and Orchestra Magazine for his innovative approach to partnering leadership and arts education, and for his innovation, creativity, and excellence in music education. Mr. Ford was selected as the 2015 National Association for Music Education National Band Director of the Year. In 2014, he was selected as the Pinellas County Educator of the Year, and the Pinellas County Music Association Secondary Music Educator of the Year. Mr. Ford was also selected as the Department of Education Florida Educator of the Year State Finalist. In 2013, Mr. Ford was selected as top 100 National finalist for the prestgious Maxwell Leadership award for Americans. In 2010 he was presented with the NAfME Music Educators Excellence Award. 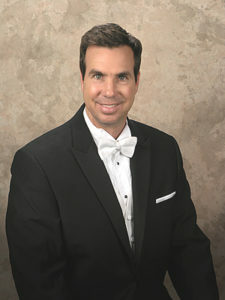 Mr. Ford was the 2005 recipient of The University of South Florida School of Music and Clarion Society Outstanding Teacher Award for his Outstanding Achievements to the Music Education Profession. Mr. Ford’s ensembles have enjoyed national recognition. In 2014, The Tarpon Springs High School Marching Band was awarded the Bands of America Grand National Champions and the WGI Scholastic World Champions. Additionally, the Tarpon Springs Marching Band was selected to perform in the 2013 Macy’s Thanksgiving Day Parade in New York City. Mr. Ford has conducted his wind ensembles at Carnegie Hall, Lincoln Center, John F. Kennedy Performing Arts Center, and the Chicago Symphony Hall. In 2009, the Tarpon Springs High School Marching Band was presented with the prestigious John Phillip Sousa International Sudler Shield award. Consistently recognized for his creativity, work ethic, and his continued commitment to excellence in music education, Mr. Ford was awarded the Tarpon Springs Community “Teacher of the Year” in 1996 and 1997 for his achievements in education and service to the community. In 2004, Mr. Ford was inducted as an honorary member of the Rotary Club of Tarpon Springs for his service, dedication, and contribution to the Tarpon Springs Community. He was the Tarpon Springs High School “Teacher of the Year” in 1997, and a finalist for The Pinellas County “Educator of the Year” in 1998. In 2001, Mr. Ford was awarded the prestigious Citation for Excellence by the National Band Association for his outstanding work and accomplishments in music education. Mr. Ford was amongst seven music educators selected to serve on the Music Educators National Conference Blue Ribbon Panel in Washington, DC. He was also selected as an honorary Director for the 2005 and 2008 Bands of America Tournament of Roses Honor Band. In 2005, Mr. Ford was selected as the Visual Designer for The Drum Corps International Walt Disney World Honor Corps. Most notably, Mr. Ford was hired as the Artistic Designer for The Opening Ceremonies of the 2002 FIFA World Cup Soccer Games in Daejeon Metropolitan City, South Korea. Mr. Ford currently resides in the Tampa Bay area and is happily married to his wife Jeannine and is the proud father of two daughters, Madison Riele, and Brooklyn Avery.